Having fun with your kids doesn’t have to cost a lot. What your children really want is time with you. Make a homemade bowling alley. Turn empty 2-liter bottles into bowling pins. Add sand or small rocks to stabilize them. Use a kickball, softball or whatever kind of ball you have on hand for the bowling ball. Scavenger hunt. Go to the nearest forest or body of water. Give each child a list of items to find. These things can be items they take with them like a shell or feather or just things they spot like a certain kind of bird. Watch teams in your community play sports like soccer, softball or volleyball. Attend free concerts in the park if your community has them. Go to any nearby free museums. Some museums have one free day a month or week. Have a history day. Explore historic buildings or sites in your area. Many can be toured for free. Check out movies from your local library and have “Movie Night” at home. Have a “Game Night” where you play board games, word games or card games. Lay out under the stars after dark and try to identify the constellations. Check out an astronomy book from your library to help identify them. If you have stale bread or cereal you are about to throw out go to your local pond and feed the ducks or a park and feed the pigeons. Borrow a tent and go camping. Sing songs, tell ghost stories, roast marshmallows around the campfire. Quite a few free campgrounds can be found around the country or just camp out in your own backyard. Check your local library for free puppet shows, storytelling, and workshops. 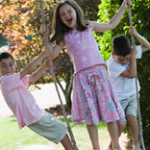 Take your kids to a playground and let them run around until they get tired. Bring snacks and have a picnic. Lie down on the ground and look up at the clouds. Try to pick out pictures out of the clouds. On a warm day, turn on the sprinklers and let your kids run through them in their swimsuits. Go for a hike. Let the kids bring their backpacks with water and snacks. Let them collect rocks and bugs. Attend any parades your community may be having…Christmas parades, Veteran’s Day parades, Fourth of July parades. Go to a local creek or lake and let them splash around. Skipping rocks across the water can be fun. Check out a cookbook for children at the library and let them try their hand at cooking. Have an arts and crafts day. Get crafts books at your local library. Save items around the house to use for crafts such as milk cartons, toilet paper rolls, egg cartons….